There are a couple of interesting things about this. First off, the assumption seems to be that the only “active ingredient” in tea is caffeine…besides the antioxidants. Most people seem to think that if they don’t sleep, it’s because of caffeine. They also seem to assume that the stronger the flavor and darker the color of the tea, the more caffeine it has: a lightly floral, almost clear cup of tea can’t possibly have more caffeine than a nearly-black cup that’s so strong a mouse could trot across the surface. The truth, as it often is, is far more complex. Basic caffeine levels depend on a huge number of factors, including your tea-to-water ratio, brewing temperature, and brewing time. So making a prediction of caffeine content based on what leaves you’re buying is already problematic. Then add other factors: plant varietal (Camellia sinensis var. assamica naturally produces more caffeine than Camellia sinensis var. sinensis), weather conditions, soil type, fertilizer used (or not), shade level, which leaves were picked (younger leaves produce more caffeine than older leaves), amount of stem included, whether the plants were propagated by seed or cutting, and so on. 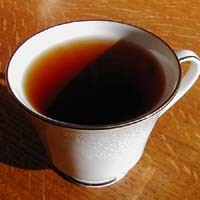 In addition, most people don’t drink single-origin teas. Most teas are at least blends of tea from different farms, but even more common are blends of tea from different growing regions or different continents. All of the above variables are then mixed up with that based on exactly how much came from Sri Lankan farms, and what percentage of the mix is Kenyan, and did they add a pinch from Argentina? Hopefully you now think it’s hopeless trying to predict caffeine levels in tea. Good. Now, you know how I said it’s more complex than that? Well, that’s still true. Along with the caffeine is a little amino acid called theanine. Actually, theanine comes in two mirror-image molecules, called L-theanine and D-theanine. D-theanine doesn’t seem to do much for humans, but L-theanine appears to enter the brain and help you to reduce stress and relax. In brain-wave terms, it encourages alpha-wave production–think meditation, not sleepiness. The tea plant only produces L-theanine, as far as I can tell. What’s even more wacky is that it appears that this relaxing effect of L-theanine is enhanced by the presence of caffeine. That’s right, you get more relaxed when you’ve got a stimulant involved. I think this combination is why people sometimes say that “coffee caffeine is different than tea caffeine”. That’s not true–caffeine is caffeine. However, there is a relationship between caffeine and the other compounds that get consumed along with it. That is what’s different. Oh, but wait…there’s more. Just like there was all of that variation in caffeine, there’s also a ton of variation in theanine levels. Now less is known about theanine than caffeine, but according to tea scientist Nigel Melican (interviewed earlier by Tea Geek), the Tea Research Foundation of Central Africa published some Japanese tests from a few years back on the subject. These findings lumped tested teas into regions. The 15 Japanese teas averaged the lowest concentration, while the highest were the 12 teas from Argentina, the 4 South Indian teas, and the 12 Malawi teas. Finally, just like the “different caffeine” thing, your body has different compounds floating around. Your body chemistry is different from my body chemistry. What you consume is going to affect you differently than if I have some of the same pot of tea. The amount you drink each day may differ from the amount I drink. And when we drink them may differ as well. Tolerances for caffeine (and perhaps for L-theanine) differ. It’s crazy. So the upshot to all this is that you simply cannot predict ahead of time the amount of caffeine in your cup, or how it will affect you. My advice? Buy some tea. Drink it in the morning in case its caffeine turns you into some kind of hyped up monster. If you like its flavor, experiment with when you can drink it and how strong you can make it. Experiment with multiple brews versus just one. If you don’t need to get up the next morning, try a cup at night to see if you really can’t sleep. Oh, and the 30-second decaf steeping thing? Doing that will very likely get rid of most of the beneficial antioxidants and a good portion of the flavor, according to the small amount of tea science I’ve read. But if it makes you feel better, you can go ahead and do it. Much of our experience with the world is psychological anyway. But more on that in another post. Hi Michael, great post on caffeine in tea. I also find the subject of caffeine and tea gets more complicated every day as I read more into the subject. I still find when talking to most customers about caffeine levels in tea I try to go with the common “myths” of green and white having less than black tea for simplicity and time. It may well be the phsycological effect of thinking that a cup of Silver Needles will not keep me up at night is the primary factor to why I sleep better as compared to drinking a cup of Darjeeling or Keemun but it could also be the calming effect of a different level of the theanine in the Silver Needles. But since you do not delve too far into theanine levels and caffeine I will tend to ofter a cup of chamomile to anyone that is afraid of caffeine affecting them negatively at night. Sleep well. Thanks! Yes, caffeine IS complicated. Yet tea customers just want a quick-and-easy answer. That’s the problem with trying to provide accurate information (from the tea business point of view) and the problem with getting accurate information from your supplier (from the customer’s point of view). There is tremendous pressure to simplify–and thereby lose accuracy–the information that gets exchanged. Add to that the problem of vendors having to *learn* all of it, which could be enough to earn you a college degree, but the average tea drinker isn’t willing to pay enough to make it worth learning. You end up getting a lot of minimum-wage people slinging tea who really don’t care and just repeat whatever they heard their coworkers saying. Why is not chamomile tea? Tea comes from the leaves of a plant with the Latin name, Camellia sinensis. Chamomile “tea” on the other hand, is made from the flowers of a different plant, Matricaria recutita. Tea is a camellia, while chamomile is more closely related to the sunflower. The word “tea” comes from a Chinese dialect word for that particular plant, and didn’t have anything to do with making a beverage out of it. People call chamomile flowers steeped in hot water “tea” (as in “chamomile tea” or “herbal tea”) because of how it is prepared. But as a friend of mine says it, herbal tea is tea in the same way that hot chocolate is herbal coffee. Completely different plants produce completely different beverages, and just because you’re combining hot water with plant parts doesn’t mean the plants are the same. That’s not to say an “herbal tea” is a bad beverage…it’s just not Camellia sinensis, and therefore, not tea. Like others, I’m still confused with “washing out the caffein” in tea. You suggested that it’s only a myth. The other day, a Tea Master from Lipton (sorry, didn’t get the name) went on the Food Channel and said that one can wash out the caffein – contrary to what’s in your article. Do we have 2 reputable views here ?? “Milk kills the benefits of tea? Regarding the frequent repeating of the 30-second wash myth, I’ve heard it repeated over and over by all kinds of people who supposedly know a lot about tea. However, I don’t think I’ve ever seen any evidence cited to back up the claim that it works. 1) “Tea preparation and its influence on methylxanthine concentration” by Monique Hicks, Peggy Hsieh and Leonard Bell, published in Food Research International vol 29, Nos 3-4, pp.325-330. 2) “Tea and the rate of its infusion” from Chemistry in New Zealand, 1981, pp.172-174.